Evening all, managed to sneak in a non GW store game tonight as phillion and my buddy Charlie popped round to grab a game of Age of Sigmar. He's been working on some Sylvaneth so thought it would be great to get them on the table to show him how they perform and as I'd just finished up my starterset of Khorne with a few extras we were set for a reasonable sized game. 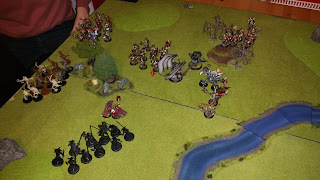 I'd selected Hold or Die from the first big book as I've seen a couple of batreps with it and it looked like a fun game, with a quick dice roll we decided that the Khorne would be the attackers and combined Sylvaneth and Stormcast force would be the defender. 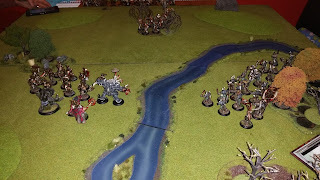 The mighty Khorne Lord Ghorak the Slayer has been tracking a small force of Stormcast deep in the of Ghyran, his scouts have learned of a secret meeting between them and some kind of ancient forest spirit, the warband is summoned to break this alliance before it starts. Unknown to him a larger force of Stormcast and Sylvaneth is on route to secure the area. 6-8 Warscrolls, max 70 wounds, 3 heroes or monsters, no more than 30 wounds per scroll. 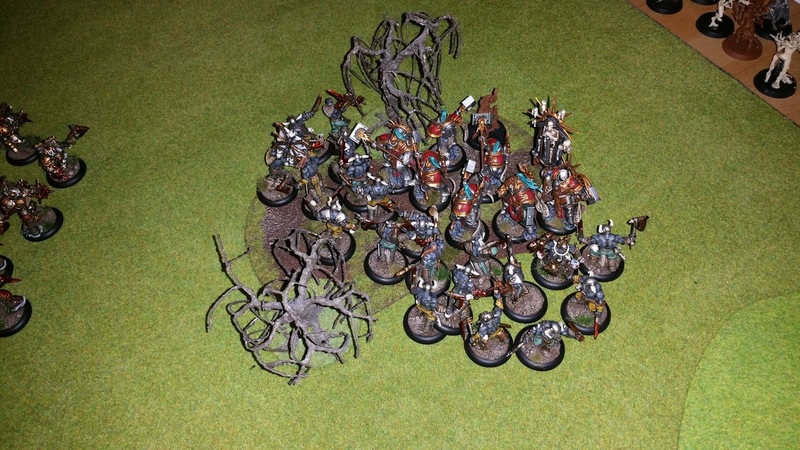 The forces of order pick a 9" circle centered on a small wooded grove and set up their Retributors, Lord Relector and Branchwraith in the wood. The Bloodbound set up 12" away split into 2 roughly even groups. All woods were nominated as Sylvaneth Woods and no other special terrain rules were used. After a short tactical discussion Charlie opts for first turn, dropping a mystic shield on the Retributors and then moving them back 4" away from the Khorne to maximise to distance between the forces whilst keeping their cover bonus. The Bloodbound warband surges forwards in response, the Bloodreavers driven forwards by the lash of the Bloodsecrator and Barking orders of the Khorne Lord forget their place and charge ahead of the main line into the Retributors, the Sylvaneth woods rattles to life killing several Bloodreavers as they enter. The Bloodreavers literally bounced off the Retributors, a combination of a very poor dice roll and 2+ armour saves left the unscathed. 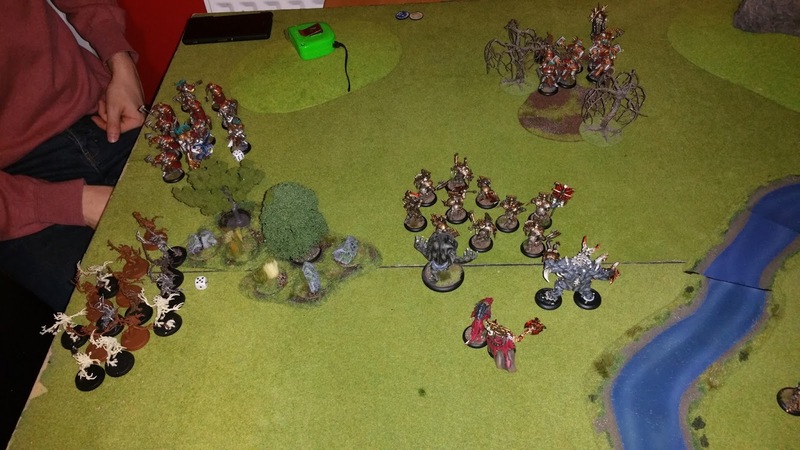 The Retributors struck back with support from the Lord Relector killing 13 Bloodreavers and the rest fled the field. First Blood to the Stormcast. 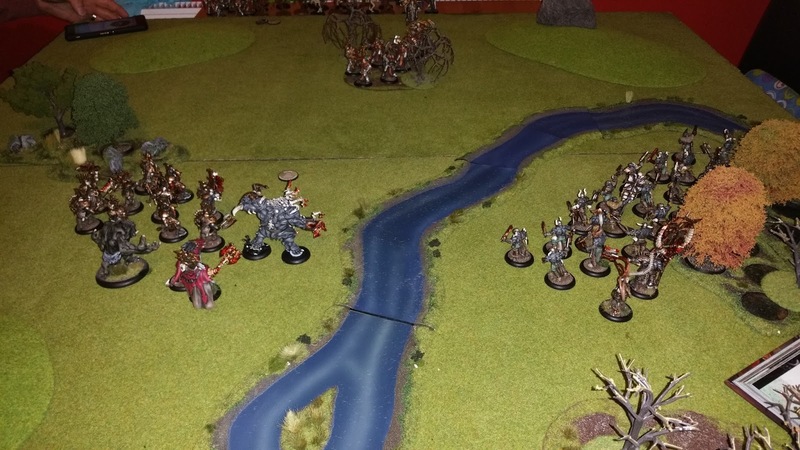 The forces of Order won the initiative for the round, Lord Relector called down Sigmar's fury onto the Bloodwrriors with a bolt of lightning killing one. On the left flank the reserve force turned up threatening the Khorne flank, luck for once was on Lord Ghoraks side and they failed to charge into combat. Keenly aware of this new threat Lord Ghorak beseeched Khorne to aid him in battle and in a blinding flash a demonic legion arrived to bolster his forces (well it would have been a legion had I more models available, in reality I gained a unit of bloodletters and a demon prince with a mark of Khorne. The forces of Chaos surged forwards to meet their foe. In the center Scyla and the Khorgorath managed to charge the retributors, The Khorne Lord and Bloodletters took on the Dryads and the Bloodwarriors veered off to tackle the retributors and Lord Celestant. 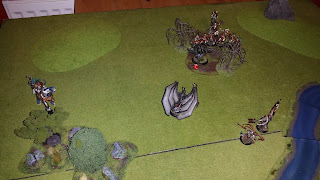 The deamon prince clearly addled by his summoning failed his charge roll. The Lord Celestant struck back at the Blood Warriors killing several though they went down fighting wounding the Lord Celestant and killing another Liberator. 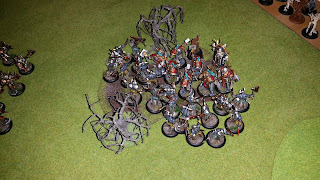 The Bloodletters took out another couple of Dryads and we were into the battleshock phase. The last remaining Bloodwarrior fled the field, rolling a double 6 the Liberator unit supporting the Lord Celestant also fled the field. Unfortunately due to time constraints and hampered by tea being late and a powercut in battleround 2 losing us some time we had to end the game here. I'd have loved to run a third turn as it would have been really bloody, with a number of Khorne heroes and the Deamon prince closing in on the Retributors and the Khorne Lord and Bloodletters engaged with the Dryads it could have been a close game. It was a really good game, a hard scenario for the attacker as you need to hit combat fast, I was hampered by some appalling dice rolling with didn't help my fight against the Retributors, in hindsight I shouldn't have charged into them as without the Meatripper Axes I was unlikely to do any damage. I also suffered from fairly poor deployment with all my heroes hanging about at the back and failing to make a meaningful impact on the battle. I didn't have the change to plant the banner as I realised that the Bloodreavers and Bloodwarriors would have both been out of range in the combat phase so I lost out on vital additional attack. I really love all the rules about calling on additional forces and in this case I could have placed an additional 6 deamon units if I'd have had the models available, though Charlie could have called on more stormcast to aid him in the following turn and would likely to have gained at least 1 unit to bolster his forces. Lesson for the day: Retributors in terrain with Mystic Shield are dammed hard to kill if you don't have ranged attacks. Been busier than my blog suggests... honest.